For the last week or so, we’ve had freezing temperatures, even during the day. When the weather is cold outside like it has been, I love to make soup for dinner. 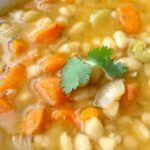 On days when I’m home all day and can toss ingredients into the crock pot at my leisure, soup is a very simple meal. However, on the days when we’re super busy, it’s hard to make a good pot of soup for dinner. Well, it was anyways. I’ve been pressure canning food to preserve it for quite some time. I’ve also done some basic pressure cooking like chicken stock and beans, but until last week I never did a full meal in a pressure cooker. After making this creamy cauliflower soup in our new Cuisinart electric pressure cooker, I’m asking myself – why did I wait so long? It’s so incredibly quick and easy to make a meal in this thing that no one should have an excuse that they didn’t have time to make a home cooked meal. Note: We initially had this Cuisinart Pressure Cooker, but switched to an Instant Pot shortly thereafter. You can make this recipe in any pressure cooker, including and Instant Pot. It’s very important to me that I serve healthy, nutritious, home-cooked food to my family. Now I can plan ahead for busier days to make something fast in the pressure cooker rather than grabbing a quick pizza on the way home. It you haven’t taken the dive into pressure cooking either, you should. Most pressure cookers, like the Instant Pot, have very simple operation and lots of versatility. I also like the safety features on the modern electric pressure cookers like the Instant Pot. When you are pressure cooking, the lid locks and it will not open until the pressure has been released. Unlike my traditional pressure canners, this pressure cooker allows you to release the pressure more quickly so we can have our meal ready pronto. If you want to make the move towards feeding your family more home-cooked meals, even when you have a busy day, I recommend that you look into investing in an electric pressure cooker. If you do have an electric pressure cooker, give this creamy cauliflower recipe a try! It was a huge hit with the girls – I got two thumbs up and that doesn’t always happen. If you like baked potato soup, you’ll love this cauliflower soup. It has the same consistency and flavors, but with far less carbs! It’s actually been mistaken for potato soup when I’ve served it before! Even if you think you’re not a cauliflower person, you will be after you try this Creamy Cauliflower Soup. This recipe will allow you to indulge in a comfort meal that’s healthier. Do you loved loaded baked potato soup, but want to reduce your carb intake? This Creamy Cauliflower Soup made in an electric pressure cooker really hits the spot! First, measure out and prep all of the ingredients. Once you start cooking, this cauliflower soup will move fast and you want everything ready to go. Melt 1/4 cup butter in the pressure cooker on the Sauté setting. Add the onion, carrot, celery and garlic, and cook for around 5 minutes or until the veggies are just starting to become tender. Next, add the cauliflower, parsley and chicken broth. Lock your pressure cooker lid and set it to cook for 3 minutes on to Low Pressure. While your pressure cooker is working, melt ¼ cup of butter in a separate pan on your stove. Whisk in ¼ cup of gluten free flour to form a paste and continue whisking until the mixture starts bubbling, about 1-2 minutes. Slowly pour in 1 ½ cups of organic milk, whisking constantly. Continue whisking until the sauce is thick. Whisk in the salt, pepper and garlic powder, then remove from heat. When pressure cooker time is up, let the pressure release naturally for about 5 minutes, then do a quick release (see the pressure cooker instruction book if you need help here). Open the pressure cooker. The cauliflower will still be in chunks, but it will break down quickly when you add the rest of the ingredients. Turn your pressure cooker on the Simmer setting, then add the contents of the pan from your stove, 2 cups of cheddar cheese and the sour cream to the pressure cooker and allow the cauliflower soup to simmer for a few minutes. 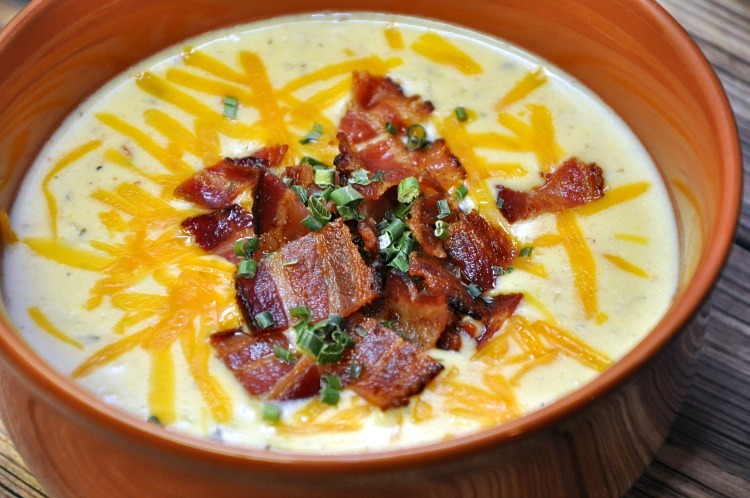 Serve the cauliflower soup hot, sprinkling with crumbled bacon, extra cheddar cheese and chives, if desired. Have you ever made Cauliflower Soup in an electric pressure cooker? What healthy changes are you working to make right now? The dishes look so tasty! I will follow the instructions to make the best dishes for my small family. Hopefully, they will like it much and thank you so much for your sharing. It is really logical and easy for me to follow. This looks fabulous! My mom is watching her carbs so I made mashed cauliflower for Thanksgiving and it was a hit so I think this will be too! I don’t have a pressure cooker though, what would I need to tweak in just a pot? I’m guessing this tastes a lot like potato soup which is one of my husband’s and I’s favorites. This is a healthy alternative to those starches! Thanks for linking up with Delicious Dishes Recipe Party! It does! It’s a spin on my potato soup recipe. The kids keep asking me to make it again so I’m making it for dinner tomorrow! This looks great. BTW, I have the same pressure cooker and love it! Thanks for sharing on Turn It Up Tuesday! I just made this tonight for the first time! It was so easy and even more delicious! I love that it’s pretty healthy too! My family loved it! Thank you so much!